This is one of the most delightful discs to come out of the Hyperion stable and it continues to confirm that sensitively produced projects in the light music genre retain an important place in the classical music field. 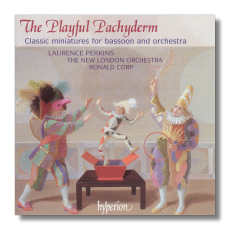 The musical fare on offer here is a joy from start to finish and in the capable hands of Laurence Perkins, the bassoon is transformed into a soothing and emphatic entertainer, a playful instrument as the title indicates. Of the eighteen pieces, one would be hard pressed to choose a particular favourite but I was charmed by the beautiful folk melodies from Scotland, Northumbria and Denmark apart from the absolutely magical 'The Playful Pachyderm' by the prolific Gilbert Vinter. There are also some famous pieces by Elgar such as the Romance, Op. 62, the subtle Four Studies in English Folksong by Vaughan Williams and the playful Funeral March of a Marionette by Charles Gounod. In the familiar and unfamiliar, Perkins is a consummate and stylish advocate of the music and he receives wonderful support from Ronald Corp who is a past master in the art of the miniature. Laurence Perkins provides fascinatingly and consummately detailed annotation and the recording is absolutely first class on all counts. I just couldn't stop listening to my favourites over and over again and this disc is definitely one of the highlights of the year, especially in the light music genre. With a cover like this one, it will surely beckon your purchase!